Discussion in 'Translations and Manuscripts' started by AJAY, Jan 14, 2018.
why in the board so much arguments regarding KJV Bible. why always some one posts questions about KJV Bible. sadly tge moderators need to close down the threads relating KJV superiority over other translations or other translations superiority over KJV. almost i am here for the past six years, benefited so much from reading threads related to many topics. sadly when i am trying to learn something about ttranslations, always the debates are heating and didnt answered to the question actually posted. last time when i asked something about inspiration its ends up with unhealthy debate and thread was closed. when i joined this board, i never saw a unhealthy debates. its just what i observed. I would ask you only two questions: Seeing as there are differences between Bibles – not the translations primarily, but the underlying Hebrew or Greek manuscripts – is it not healthy and sound scholarship to try to discern which is the true text? And, Is it not sound to discern the differences between Roman Catholic positions on the Bible texts, and Reformation positions, given the latter's dependence on the doctrine of Sola Scriptura? I would agree with you that some of these discussions turn unhealthy and contentious. But our desire for truth is born of good motives, whatever side we take. I agree that examination and validating are very important things, it is very crucial when it comes to the scriptures, it is more important. The emphasis is more on translations rather than the underlying text of Hebrew and Greek. Actually as a seminary student I am curious about learning which one is more close to original manuscripts. It is TR or CT, I want to know, so I use to read the topics about translations. But sadly from few months onwards if someone post a question related to scriptures, it's ending as a KJV/ modren translations debate. I agree, it is sad Ajay. Don't be discouraged by what you see here though, brother. This topic can become heated, but it doesn't need to be that way. Whether you use a good modern translation (ex. ESV, NASB), or the KJV, you still have the Word of God, and are not in spiritual danger because of it. And don't be swayed into adopting a KJVO position because of the personal pain you are experiencing. I'm sure the temptation to believe it is there because of your relationship loss, but if that is the case, then you are not going to be thinking clearly enough. Mr. Rafalsky, I must be reading you wrong in post #2, for it seems like you are charging non-KJV users with Roman Catholic tendencies. Surely I am mistaken. I agree, it is sad Ajay. Don't be discouraged by what you see here though, brother. Some people can't help but turn threads in that direction at any given opportunity. And don't be swayed into adopting a KJVO position because of the personal pain you are experiencing. I'm sure the temptation to believe it is there because of your relationship loss, but if that is the case then you are not going to be thinking clearly enough. Relationship loss, yes because of KJVO, however if I convicted KJV is more superior than any other translations, I am not going to separate from those who don't agree with that. Unless they are serious errs regarding fundamental doctrines of the Bible. I am amazed to see Asian people especially some Chinese people who can speak English, some reformed churches in singapore, Baptist churches in Philippines, are teaching that they need to separate those who don't hold to KJV superiority over other translations. This causes disunity. Slowly this type of mentality will spread to the other countries. I love my KJV Bible, reformation heritage KJV study Bible, I used for my daily reading. I love to sing some psalms which are from KJV Bible. How can I say to my fellow brother, hey if your reading Esv, don't do it. It's a bible from corrupted text. I was amazed by one of my friend stop coming to my house, because he saw Esv study bible in my home. I wonder how will Westminster divines will react, if they live in our present age. I had no idea how widespread KJVO thinking is around the world, even in non-English speaking countries. It is so damaging. I'm sorry to hear about your friend. And yes, by all means, if the KJV is your preferred translation, read it! Our unity is in the gospel, not Bible translations. I hope you have a blessed day, brother. Praise God for your example of not making a big issue where there doesn't need to be one. Ajay, since your interest is primarily in the underlying texts and trying to determine any 'superiority' between CT and RT, I would try to do independent study until you at least have a good grasp on the fundamental issues. I think your main complaint is that any conversation on this board around that issue always devolves into debate over KJV vs. critical text translations. That is disappointing, I agree, since it really clouds the issues. Anyone holding to a KJVO position who is harsh and dogmatic and schismatic about the use of other translations is sadly misinformed, of that you can be sure. But we live in difficult times where laymen must discuss these things outside their local churches, as their church officers often aren't familiar with all the facts. This makes it more difficult. I think there's a lot of information in the older Puritan Board posts about the RT and CT. And I'm sure there is more food for thought out there on the internet. Sometimes it just takes a long time to come to a settled position on some issues. Until then, I would just continue to study- and sorrow and grieve for your girlfriend's, and others you love, misunderstandings and where those misunderstandings take them. Pray for them, and pray for the church at large, that times of reformation and revival would come. I think they would be appalled at the church's acceptance of the higher critical approach to translation and the methods whereby variant texts were used to amend the Bible we had. But they knew better than anybody that reform is a work of the Holy Spirit, and so I think they would set to prayer. I hate to see any controversial topic on PB become 'heated' and divisive. This happens when members feel so strongly about their position that they prefer to 'die on that hill', rather than give any ground. Some are as tenacious as gladiators seemingly and go on and on arguing their position. I know that certain issues are that important if seen it as an incorrect doctrine, or worse, being touted. The combatants feel they cannot just once state their position/opinion and move on. In some past threads this has saddened me. Particularly if the argument seems to become personal. I think of 1John, especially chapter 3, and urge the frequent reading of that epistle to ground us in the love for our brothers ...... and sisters ... in Christ. As for me, I've been in those frays regarding RT versus CT for years now. Years ago I was torn between the two, but I happen to believe that we have the best of both worlds in utilizing translations from both the RT and CT now, and feel good that I've reconciled myself to that position. For me the debate is settled. I have labored long to make clear the distinction between KJVOnly, and KJV priority. KJVO says that no other version is legitimate, and I have friends who hold that. Myself, I’m a pastor and a teacher, and when a pastor takes that view (KJVO) it will either split the church, and / or not tolerate those who hold differing views—so I teach that, being KJV priority, I hold the KJV’s underlying Hebrew, Aramaic, and Greek texts the better texts, with the result that the translations made from them are likewise better—preserved in the minutiae—but that the other versions translated from the CT—preserved in the main—are nonetheless sufficient for the Lord to nurture both individuals and churches into maturity and godliness; in other words, the non-KJV Bibles are legitimate Bibles, the only question being individual variant readings, are they legit or not? I’m not going to divide my church over this issue. Nor will I delegitimize any Bibles, as this is the very lifeline of the believer’s communion with the Savior—His word. How awful to poison a man’s mind against his Bible! Argue about variants, ok. But not trashing Bibles. Now we get to a different aspect of the matter. One that is not often brought into the discussion. E.R., to answer you directly, No, I do not charge or insinuate “non-KJV users with Roman Catholic tendencies”! However—and it’s a big “however”—many Reformed folks may simply be unaware of Roman Catholic involvement in the text-critical industry. “Pope Francis embodies several ‘first ever’ aspects: he’s the first Jesuit pope, the first Latin American pope, and the first to choose St Francis of Assisi as the patron of his papacy. He combines modesty, not least in his lifestyle, with fervent engagement for the poor, and traditional Catholic theology with courageous advocacy for human rights. What amazes me is that good Reformed souls can fall for the Roman assault on Sola Scriptura through their prize MSS (the “Queen of the Uncials” Vaticanus is called), which is the main exemplar and basis of the Greek Critical Text, throwing into disarray the defense of the Reformation. Is it not evident? The textual conflicts among the Reformed—indeed, the entire Protestant camp—derive from the Catholic assault against Sola Scriptura via the variant-laden manuscripts they have for a long while, to this very day, promoted as the superior “neutral” text, or the superior eclectic text. Their agenda? Furthering “interconfessional relationships… under their [the Vatican’s] supervision”. What am I saying? That, in large measure, Rome has defeated the Reformation’s stand. The loss of the Reformation’s Bibles in lieu of the plethora of Critical Text Bibles—which foment the discord and confusion we see here even in this very thread—has weakened the faith in a sure and reliable word of God. I’m not making this stuff up. If the UBS-Papal union and collaboration does not convince you, I don’t know what will. Yes, some good and scholarly men (and women) believe the CT the superior text despite the Roman connection; well and good. It remains that Rome’s agenda has succeeded: the doctrine of Sola Scriptura as the Reformation’s foundation has been destroyed. We are in disarray. Oh, it may seem we are thriving, and individual churches (and individual souls) may seem to be so, for the time, but the Reformation ship has taken a torpedo in the hold, and the leak cannot be mended. Some may decry what has happened, and call for folks to return to the Reformation’s textual standard, but the hole is too big. The lifeboats of local churches remain. May God our Shepherd (to change metaphors) guide us to Celestial City, using skilled and godly pastors who with wisdom take His direction. I believe, as an amillennial proponent, that the eschaton draws near, with the preliminary judgments, catastrophes, and apostatizing, and then the global turning against the saints before His return. How long? I do not know. This is why I hold up the Reformation Bibles: a sure word of God is our strength, and the standard of the Spirit of the LORD when the enemy comes in like a flood (Isa 59:19-21). While I appreciate your denouncement of KJVOnly-ism, I am afraid that overzealous KJVPrimary-ism can be just as divisive and harmful. Ajay has created a thread lamenting that so often discussions on the Puritanboard quickly turn into heated CT/TR arguments, and has asked why this is so. You have followed by essentially calling CT Bibles products of the Whore of Babylon, and leaving it up to the reader to easily connect the dots that proponents of the CT are complicit (possibly unawares) in "the doctrine of Sola Scriptura as the Reformation’s foundation [having] been destroyed"
If nothing else, you have given Ajay a great lesson in how so many threads devolve into heated textual arguments. I hope the irony is not lost on you. E.R., I told you how I deal with the issue of varying Bible versions in the church. With scholarship mixed with grace and brotherly care. I notice you have completely overlooked the United Bible Societies' association with and agenda furthering Papal Rome's agendas—specifically through the means of the Bibles they produce, in their very own words. I acknowledge the papal involvement and show how I deal with the results on-the-ground in the local church. You condemn me for pointing out unsavory facts? You would prefer I stick my head in the sand and ignore the Roman connection? Pretend it doesn't exist? If I point out these undeniable facts, and still deal graciously with the CT, do I do wrong? I actually use CT Bible translations when I study the Scriptures, as they may give a shade of meaning or a clearer turn of phrase than the KJV, which is a big help to me. I can put aside the Roman connection in my studies, and in my teaching. But in a discussion such as ours, it is off limits? My understanding of the OP was that this thread was to be about *why* these textual discussions very often turned heated, not to open the door to yet another textual discussion. I am not addressing your concerns because I believe that by so doing I would be disregarding Ajay's intentions for this thread. JimmyH seems to have it right in his assessment of things. Finally, any fingerprints of the Vatican's on my Bible are definitely worth looking into, but not here. I am not saying your concerns are not valid. I think it is a good question, Why do these discussions so often become so heated? That is very true. The same can happen with text messages or emails. But would you agree that KJV threads can get more heated than the average discussion here? Mr. Rafalsky, please forgive me for the tone of my posts not being discernibly kind. give it the most charitable reading. And then wait and cool off from the heat it caused you before answering back! Hehe. Passionate defense or questioning doesn't have to equal heat or anger or anything uncharitable. Indeed. Thank you for your words. Perhaps you joined at an unusually quiet time, or you just missed them. Several recurrent themes are almost always guaranteed to generate more heat that light until a moderator finally cuts them off. I understand that baptism used to trend that way but the separate answer subfora were established before I got drawn into any of those. Perhaps if someone had the time they could make a numbered list of the standard arguments so that posters could just post the numbers. Then proponents could just post 'TR 1, 8, 12' with a response of 'BR 4, 5, 7'. Bonus points for the rare novel contribution, and minus points for an argument spelled out that is covered by the numbering system. E.R., I forgive. I think we are prone to getting heated on this topic simply because our Bibles are so crucially important to us. Thank you for the primer on the relationship of the Vatican with the variouis CTs. While I have studied Greek and Hebrew for years, and some of the textual discussions interested me, I did not really consider the point you are making about potential 'behind the text manipulation' by Babylon. That might be a more refined and better discussion thread than just RT vs CT. Some of the reasoning behind the KJV extreme viewpoints seem to be that they require both a perfect Greek text, and a perfect Translation, but only the Originals themselves qualified for that. The problem is that much of the heated discussion regarding the sources underlining the CT position make assumptions that they were an effort by monks to make the scriptures corrupted and polluted. That suggestion would save an awful lot of typing. This is what I am continously hearing from people those who hold to Kjvo, all the texts that have an Alexandrian influence are corrupted, they copied with the intention of adding or subtracting the words to pervert some doctrines. Ajay, I don't think the intent was to corrupt or pervert; some thought they were correcting errors, imposing what they thought were proper to the originals. Yes, there are some extremist and bitter-hearted views, but this side of the terrain is swampy, and not profitable to wade through, not for me at any rate. There were skilled men, such as Origen, who had a high esteem of his own judgment, and made unwarranted corrections. As for the KJVO folks in your country, better to steer clear of them if they are judgmental of you and of others. I think you're on the right track, being gracious to those who differ with you. If a person has a view of the Bible, but doesn't love his brethren, he or she is not reflecting the heart of God. There was no evidence that has been documented though to support those notions regarding what was being done to the manuscripts by those holding to the CT source, and the truth is that regardless of which Greek text preferred, all agree on substantial all major areas, and there are no doctrines disputed in any of them, and regardless if one uses and prefers the KJV, Nas, esv we have a reliable English translation to use. To me, far more important than which Greek text used to translate would be the translation philosophy used, as a more formal version such as KJV/Nas/NKJV preferred to those such as Niv/NRSv for example. I look at it this way. If I have a Bible that suggests God may have said something, or maybe did not. That this verse is in some manuscripts recording as Jesus said something, but another one doesn't have it so maybe he didn't. Then what in my Bible can I ultimately trust. The passages that don't contain footnotes? I sometimes recently have thought this. Many call themselves Calvinist. I wonder what would be Calvin's response if he was given one of the modern version's with parts of the Lord prayer missing, other passages missing with a number leading him to a footnote saying others have this". Or a passage with a note that the oldest manuscripts leave this out. Or that God said the womans desire would be against her husband. 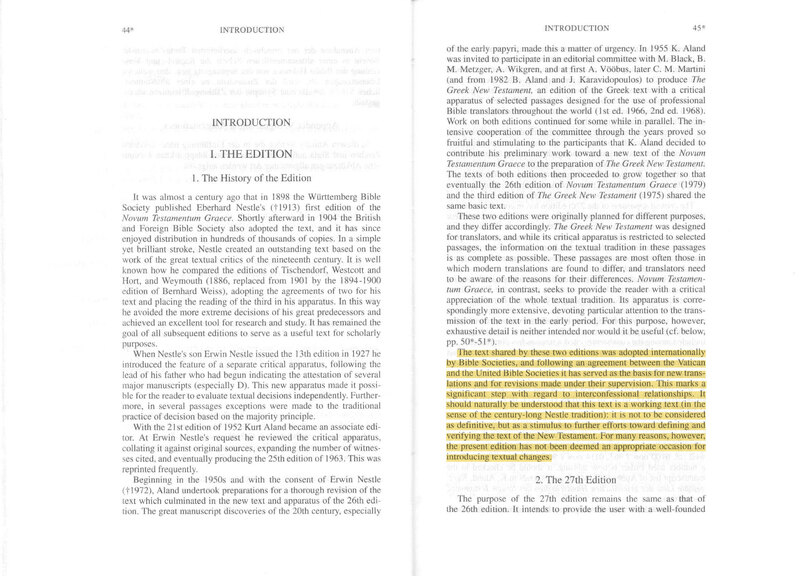 Reference to the blood of Jesus taken out and all the other footnotes and alterations. Then he gets supplied with the names and belief of some of the translators and their stance on creation etc. I wonder what his reaction would be given the reverence and respect he gives God's word in his writings and what he says about those who carelessly handle it! Brett, I am a Calvinist. I have great respect for John Calvin. However, he is not the Christ. He is not even an apostle. The differences in the manuscripts existed over a millennium before Calvin was born. What Calvin would think today is total conjecture from either side. Here’s something both sides should agree about. If God didn’t breathe something through the pen of the apostles, then I don’t want it inserted into the Scriptures. If something was God-breathed through the apostles, then I don’t want it removed. Whether it’s true or not isn’t relevant. Did God breathe it? For example....The Westminster Standards are true. I don’t want them inserted in Matthew 6 into the Sermon in the Mount. So the blood of Jesus, I don’t want it inserted or removed. I want what the apostles wrote. I would hope we can agree that much and that Calvin would agree at least on that. Things could have been added. Things could have been removed. Both were in manuscripts long before Calvin or the KJV. Give me what he Apostles really wrote. I hope you agree. In Garnet Howard Milne's, "Has the Bible Been Kept Pure?" he recounts the recognition by the Westminster Divines, as well as Luther and Calvin, that there were copyist errors and such in the apographs. This did not prevent them from believing in the inerrancy of Scripture. We have that essentially in any good translation of the scriptures, regardless if KJV/Nas/Esv et all.